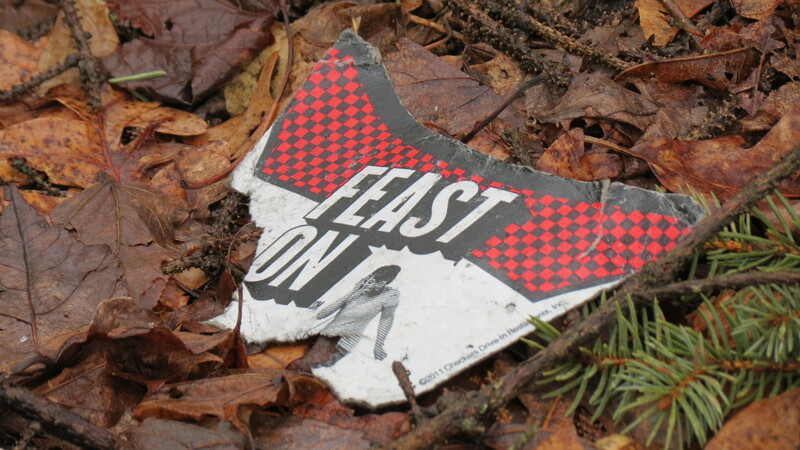 Snow has melted, fallen, and melted again — but winter’s debris is still there. I don’t mean the fallen leaves and broken twigs that litter the beds and lawn. I’m referring to actual litter. Due to a combination of winter winds and my home’s location at the head of a T-shaped intersection, my yard is the final resting place for not only the leaves from the intersecting street, but also for my neighbors’ garbage. Whether it’s been set free from cans on garbage pick-up days or dropped on the street by passers-by, trash loves my yard. Carried on currents of air, pieces of garbage eventually make their way into my garden, catching in shrubbery, landing among the leaves, mingling with branches. If I can’t get to litter removal because of too little time or too much inclement weather, my yard eventually looks like that house, the one that makes the neighbors cringe. After all, their yards are clean. As I go about my trash business, I find myself learning a lot about my neighbors. Most of them seem to have very bad eating habits. There’s always a fair share of fast food wrappers lying about, but this year in particular has been a banner year for butter consumption. I wish I could trace the origins of each piece of debris. Then I could knock on that neighbor’s door and remind them that they should adopt a more heart healthy diet. I’m just trying to be neighborly. I realize that some garbage escapes from garbage cans or the back of a garbage truck on trash pick-up days. But with the amount of plastic trash bags available today, is there any real reason for fly-away trash? My local supermarket boasts a sizable selection. There are bags that tie, grip, stretch, and have a scent. It’s almost too many choices. One day, I found myself sniffing boxes of garbage bags as if they were fragrance samples. I wonder what scent my garbage would like . . . lemon? Clean linen? Lavender? Tara was one of several young people in a car that drove by my house last summer — and she was the third person to toss out a bag of garbage in front of my house in as many days. After the bag hit the ground — and the car sped off — I opened it. There, among the candy wrappers, used cosmetic stuff, empty water bottle, and dirty napkins, was a receipt with Tara’s full name. I figured that Tara was of the generation raised with the “it takes a village to raise a child” philosophy. The only problem is that we forgot to tell the child that he/she is part of the village, and as a citizen, he/she has a responsibility to the village. In any event, I thought that receipt with the name on it was gold, and I envisioned myself driving to Tara’s house and returning her garbage to her. Unfortunately, it was too common a name and my Google search left me with the only thing I truly had: a bag of someone else’s garbage. Littering is certainly one of my biggest pet peeves — and it’s all because of two childhood influences that have stayed with me through the decades: Iron Eyes Cody and Woodsy Owl. Iron Eyes starred in an early anti-litter commercial, the one where a tear rolls down the face of a Native American as he looks at the polluted landscape. I too feel like crying, especially on days when I’m in my car, stopped at an intersection. As I wait for the green light, I have several minutes to look — really look — at how un-green life has become. Then there was Woodsy Owl with the catchphrase: “Give Hoot, Don’t Pollute.” I took that one to heart. To this day, I will hold on to a gum wrapper until I find a trash receptacle. Every little hoot helps, I figure. I mention all of this because as we busy ourselves with purchasing energy efficient light bulbs, sorting our papers from our plastics, pushing “green” initiatives, and debating climate change — the planet, or at least my corner of it, seems dirtier. We seem to have forgotten the most basic, most simple thing to do to save the planet. Wherever I look, I see peoples’ garbage — clothing, furniture, used diapers, food containers, and so much more — in parking lots and parks, along streets and sidewalks, in my yard and flower beds. Some days it makes me angry. Some days it makes me sad. Some days it makes me want to retreat into the serenity of my yard and lock out the outside world. But on days like this, when it’s time to clean, I see that the outside world has infiltrated my world — and I think to myself . . .
One man’s trash is not this man’s treasure. I thought it was only my house. I’m on an inside curve, and everything swirls into my yard. 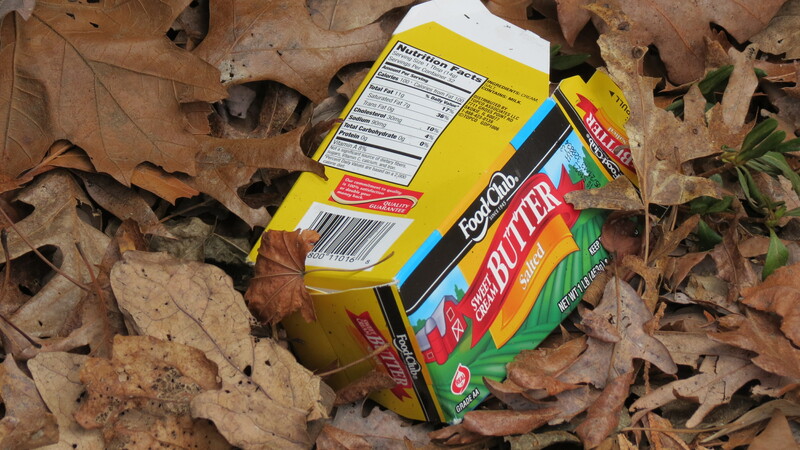 You’ve really got me thinking about the butter cartons! Weird. I can only think that all of this wintry weather is making people want to bake, hence the proliferation of butter husks. I feel your pain! In my urban neck of the woods I get it times two. I’m constantly finding very disgusting things on the creek bank (will spare you the details), but nothing is worse that sitting on the porch and watching cars drive by, windows roll down and trash being tossed out the window in broad daylight! I think it’s all about lacking self respect. Hi Mario. I really couldn’t believe it when I saw it happen in front of my house. If I could have, I would have chased the car like a mad dog. I agree — it’s a total lack of respect and, I think, a consequence of peoples’ disconnect from community. Very sad. How sad. One thing I am struck with when traveling to different parts of the country is how there does appear to be different levels of attentiveness to trash/debris accumulation. On the whole, Minnesota is a pretty clean state — traveling by highway certainly you do see some garbage, but not the bags full on a regular basis that you may see elsewhere. It is so disrespectful, and ugly. That Iron Eyes Cody commercial came to my mind, as well, and then — lo and behold — there you went and mentioned it! Hi Kat. It’s funny that you mention that idea about observing while traveling. I also find myself looking for trash along the side of the road and comparing what I see to what I have at home. I am struck at how often the grass is greener in other places. Hi Kevin I feel your pain! My issue is dig owners who do not clean up after their dogs. I have a dog as do many of my neighbors. Sometimes it sounds as though I am living in a dog pound! Most pick up after their dogs, others do not. I still havent found the culprit as it seems they walk, let their dogs out at night. I find daily gifts in my front yard and on my sidewalk. It seems more distressing to have to clean up after another owners dog, than your own! I think you probably feel the same way about the trash in your garden! Hi Lesley. I feel the same way about the dog issue as I do about the trash issue. I even get annoyed when dog owners do not clean up after their dogs no matter where the mess is. Again, it’s a simple process that’s courteous, responsible, and shows pride in the neighborhood. I get some trash by the street, but the crows like to bring small, light colored stuff and drop it in the backyard. It took me a while to figure out it was getting there. Hi Deirdre. That’s interesting. I’ll have to look skyward to see if any birds are behind the trash. By the way, there was recently a very interesting show on PBS about crows and their intelligence. Fascinating birds. Twice the crows have warned me about bald eagles after my chickens in time for me to chase the eagles out of the yard, so I have a soft spot for crows even if they do bring trash into my yard. You might be interested in this link. It’s a documentary about crows, and explains their language, use of tools, and intelligence. Link? I don’t see a link. Sorry about that. I’ll try it again. Here is the link. Here in Ireland as the recession bites deeper there is more garbage thrown out of cars, especially on our country roads. Disgusting and as you point out most of it is from thrashy “foods”. Bring back paper packaging I say. In my area, Seattle, they are going back to paper and/or compostable packaging at the fast food places. I still pick it up out of the garden when the crows bring it. In my area, we’re drowning in plastic. Bridget!!! So nice to hear from you. I wonder why hard times would have more people tossing trash. The whole thing is quite distressing. I also agree with you about paper bags. In my area, they’re very difficult to find. The city of Seattle has banned plastic shopping bags. Paper bags are allowed, but the stores are supposed to charge for them. We are encouraged to carry reusable shopping bags. I do like being able to use reusable totes. Sturdy, practical — and handles! Deirdre, thanks for the info — many cities can follow Seattle’s lead. I was disgusted by your description of “Tara’s” behaviour but usually that kind of stuff comes back to haunt them – don’t worry. This post reminded me of an episode of Mad Men, when Don was still with Betty. They had taken the kids to a rural area for a picnic, and when they were done, the family got back in the car. Don stood up, shook off the blanket and all the litter remained there on the riverbank as they drove away. Nary a thought. I thought we had become smarter than that but apparently Tara and crew have not. Hello Astrid. I remember the “Mad Men” episode. In fact, I’ve often think about it when I see wayward trash piling up, or people just casually tossing out their garbage — within steps of a trash receptacle! Good grief I thought you had taken pictures of my yard. LOL! With the winds we have here on top of the hills and the direction it comes from everything ends up in my yard or on my front porch. LOL! Have a good weekend. 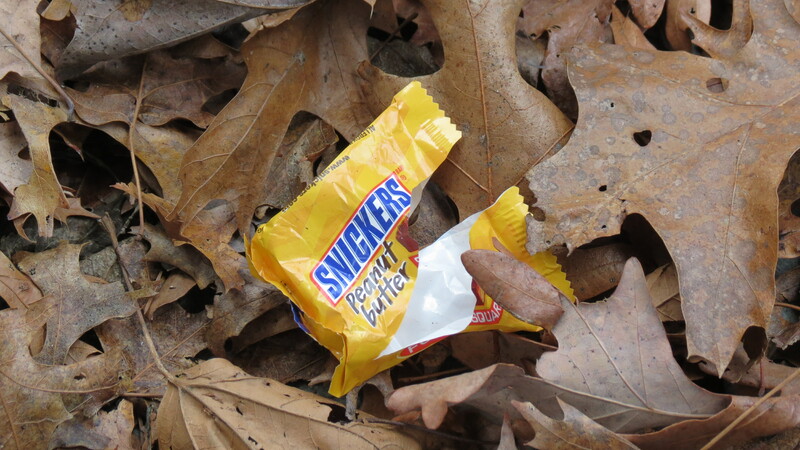 By the looks of it, there’s barely a-one of us who avoids getting littered. That’s downright sad, creepy, too. Although… I prefer picking up trash to discovering a dozen divits where someone decided to pick and choose among the plants out in the parking median. Now that was a gut-wrencher! Hi Cheryl. Why am I not surprised that people would steal plants from a public median? Because I’ve had a plant stolen right out of the ground, as well. Something wicked this way comes, indeed. This certainly struck a chord! Unfortunately, there seem to be Taras all over the place. Like you, I deposit garbage in appropriate receptacles! I live in an urban area between a home for people with emotional/behavioral disabilities and the nearest convenience store. The residents can’t drink or do drugs on the grounds of the home because of drug interraction issues. Having nowhere to put their dark plastic bag wrapped fortified beer cans and other interesting items, they simply throw them in my parking strip or try to hide them in my shrubbery. Folks who walk their dogs in this area are very conscientious about scooping and bagging at the nearby park and then throwing the bags in my garden. People can be so rude! Hi Peter. You’ve addressed a whole other issue when it comes to litter. Whenever I take a walk around the neighborhood, I keep my eyes aimed downward, looking for any paraphernalia from illegal activity. It seems that as the economy has gotten worse, there’s more trash from people’s drug use. What are we doing to ourselves? 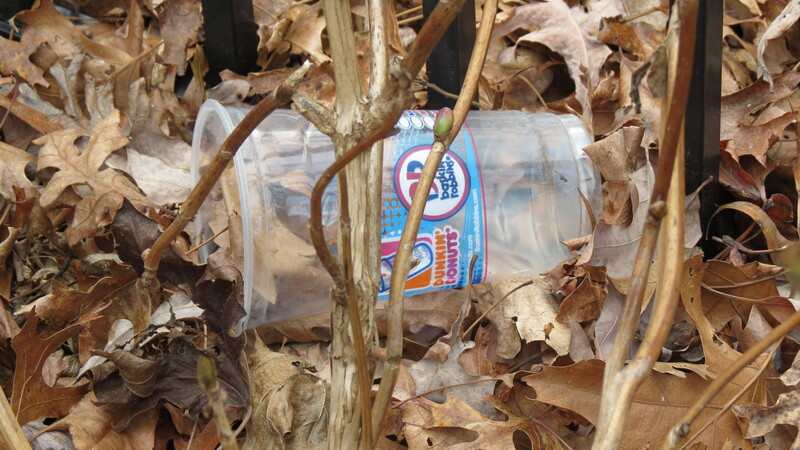 Given how you feel about litter, it is terribly ironic (and terrible) that so much lands directly in your yard. Your photos are excellent examples. I just don’t understand how anyone, young or old, can justify just throwing trash out a window or not picking up after themselves. On the very rare occurrence of something either getting away from me or a mixed signal and I leave something behind that another person will have to deal with, I have felt so guilty and uncomfortable, even if it truly was an error. My granddaughters, still very young, are learning, and they point out trash on the side of the road and get quite indignant. One of their favorite remarks is “how rude” other people are to not use a litter can. Sadly, I think the problem is getting worse, and I have never known one person to actually be fined for littering. I do wish your google search for Tara had come up a winner! Hi Debra. That reminds me of the guilt I feel if I’m chewing gum and need to dispose of it. I will chew and chew until I get to a receptacle. I worry that someone will step on my gum or that an animal will start chewing it and choke. . . I’m glad to hear your granddaughters are learning the importance of community and the environment at an early age. Eloquently expressed. Our house is on a small but reasonably busy street and we have steps at the front leading to the kitchen – those steps accumulate with all sorts of s**t, fag buts, crisp packets, sweet wrappers you name it we see it down there. and to keep some modicum of sanity I try and keep it clear – my need to not look out at other peoples rubbish as I wash the dishes at the sink is high . Hi Claire. It’s interesting to see that the business of unwanted trash is global. It would be nice if everyone did their part. Hope all is well. Kevin, those pictures from your garden could have been from my garden after a windy couple of days, here in London we are drowning in litter people just throw on the street. We have a street sweeper once a week in my street, but it just isn’t enough to keep up with the rubbish. And most of my neighbours don’t pick up the rubbish that lands in their gardens so next time it’s windy the rubbish is passed onto my garden. 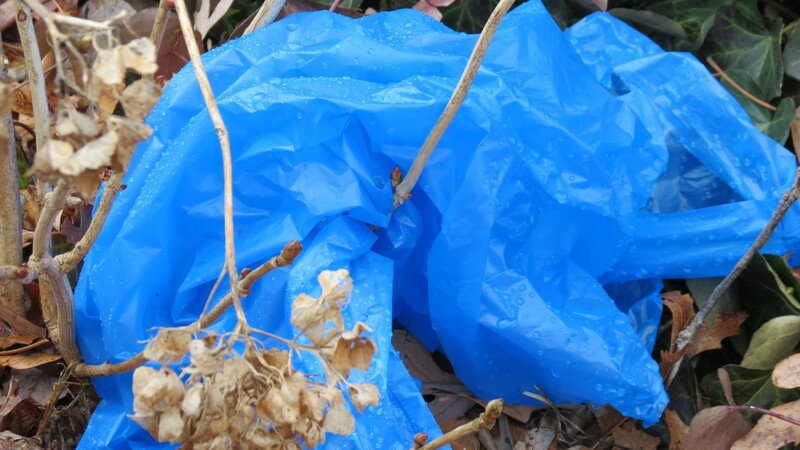 I pick up rubbish and plastic bags on a weekly basis all year round. I wish the children of London were having the same tradition as children in Norway, every spring, after the snow has gone, they spend 2 school days outside picking litter along streets and in parks, anything that might have been covered by the snow and then emerged, cleaning up everywhere for the spring. It has been a tradition since my grandparents went to school, so at least since early 1930s. It teaches children not to throw rubbish on the street, and when you have learned it as a child you tend not to do it as an adult. We don’t have street cleaners in Norway, it is not necessary, we don’t have much rubbish in the street. But the wind is not the only one bringing rubbish into my garden, there are foxes being fed bones somewhere nearby, and they often come and deposit clean eaten bones, probably beef or pork, into a pile in my garden. I was very surprised the first time I saw it! And then we have the crows and magpies, they collect all sorts of shiny and colourful things and put them in my tree, where it eventually will fall down on the ground. One summer I collected 23 cable ties in different colours! Where on earth did the birds get them?? Wait. A. Minute. Do you mean to tell me that some woman drives by your house and drops off her bag of garbage in front of your house? What’s wrong with her curb? I’m sorry but I just can wrap my brain around this one. WTF is wrong with people?!?! Ok with that off my chest: Great post — this post should be on every billboard in America! I’ve had worse. Some friend of the renters next door decided to clean out his car and trunk in front of my house; clothing, a tire, and other stuff, as well as the contents of the ash tray and fast food wrappers. Unbelievable! The nerve of some people, eh? If I didn’t see it with my own eyes, I would be floored as well. That is so true! My and my husband’s first house was on a corner of a busy intersection (which was great for us as first time home buyers but the realtor told us would NEVER sell) and we too collected garbage from all around the property. We discovered all sorts of grossness – and I’m now convinced Tara must have driven by our house a time or two also! I never can understand where people get it in their mind that that is okay – I can’t even leave an unwanted item someplace else in a shop – I need to return it so I don’t feel bad! But remember … Tara has to live somewhere, and I think (and hope) karma will come back for her and the rest of the litterers! Hi Kelly. Glad you enjoyed the post. You and I must be cut from the same cloth. I’m also the type to reshelve an item if I change my mind in the supermarket, and small wrappers fill my pockets until I find a trash can. To me, throwing out one’s own trash seems like the easiest way to make the world a better place. Be well! Kevin, I too have nursed that fantasy of getting in touch with the litterer and giving them back their trash. Once in downtown Gettysburg, I ran after some people who had just dropped trash on the sidewalk and said, “I think you dropped something back there.” The result wasn’t anywhere near as satisfying in reality as it was in fantasy; they just looked at me as though I were whacko and kept walking! 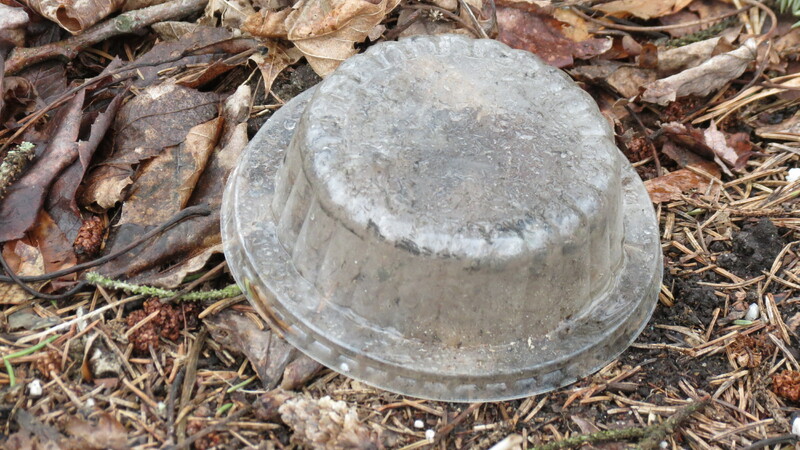 I find other people’s trash all the time in my Gettysburg back yard and on the patio, and I always wonder where it came from and how it got there. I have a lot of neighbors who think nothing of putting out their garbage on really windy days and then letting the lid blow open so it can blow all over the neighborhood. I’ve come home from work to see our woods and yard filled with trash. It’s infuriating. Karma can be a b*tch so Tara has her rewards coming! The trash goes out on trash day regardless of the weather. What are people supposed to do? Are they supposed to stay home from work and watch their trash bins to make sure they don’t blow open? Get real! I don’t think anyone is saying they should stay home to monitor their garbage — but there are cans with locking lids and there are trash bags that can be tied close. Judging from the comments, there are a lot of homeowners battling the garbage monster. Perhaps the bottom line is that all of us need to do a better job at keeping a lid on things — or at least a tight bag. 🙂 And no one should be dropping their trash where they walk or drive. Just dump it — the effort goes a long way. Hi Kevin. A trashcan with a locking lid is a good solution to the symptom. The Problem, however, is much trickier. In defense of people (not Tara, other people) much of the litter that strays onto the roadsides gets there by accident. My latest blog post speaks to that. And why must we have so many wrappers within wrappers, anyway?! But that’s another topic. For another day. Hi Pam. I’m sorry for taking so long to see this comment and responding, but (ironically) your comment found it’s way into the spam folder, as if it were garbage. Your words have been rescued and placed in their proper place. I’ll be sure to check out your post. Be well!